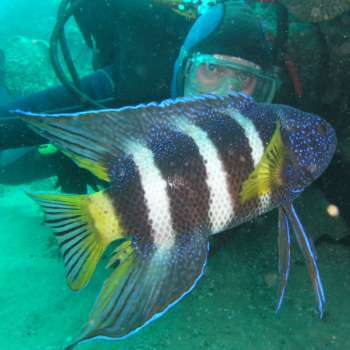 Michael McFadyen's Scuba Diving - The Boulders, Norah Head The Central Coast of New South Wales is one of the most popular holiday locations in the State. Only just over an hour from the centre of Sydney (even less from the northern side), it stretches from the northern shore of Broken Bay to Lake Macquarie. One of the better places to visit is Norah Head which is towards the northern end of the Central Coast (90 minutes from Sydney). There are some very good dive sites here as well as some nice caravan parks to stay in. The only real problem with diving Norah Head is that the boats have to be launched from a very rough boat ramp straight across the beach into the open ocean. This limits the types of boats that can be used and also limits the weather conditions in which boats can be launched and retrieved. Just a little over a kilometre or so from the boat ramp is a bombora called The Bull or Bull Rocks. The reef here comes up from about 20 metres to the surface. To the north-west of The Bull is a dive site called The Boulders. The GPS reading is a latitude of 33º 16' 21" S and longitude of 151º 35' 00" E (using WGS84 as the map datum). If you use another datum you may be about 220 metres off the wreck. See my GPS Page for more details and how to convert readings. The site consists of a wall running from north-west to south-east. The reef is about 17 metres on the top and just over 21 metres on the bottom. Off the wall there are hundreds of boulders, some the size of a table, some the size of a room. There is a mooring in this area but when I visited the top portion was missing. From where you have anchored, swim around the boulders, looking at the great gorgonias, sea squirts, sponges and other fixed life. Fishlife includes one-spot pullers (lots) silver sweep, yellowtail and bream. You may also see large schools of luderick coming from the reef top to the bottom. Other things to see include eastern blue devilfish and giant cuttlefish.